A/N: Welcome back to Kidnapped! This chapter will have some seducing in it (it&apos;s actually quite funny with my horrible writing skills) it&apos;s all from Mary guys! Enjoy! Please read the important authors note at the end! Tohru changed her clothes and packed a light bag. Meanwhile Kenta pulled out his cell phone, he had many missed calls from an unknown number. He called back hesitantly. "Kenta, WHERE HAVE YOU BEEN?" "I&apos;m sorry I can&apos;t take part in this. Tohru knows everything. Just come and kill me already." "Oooo, Kenta sweetie. It&apos;s not that easy." The person on the other line hung up. Mary&apos;s eyes glowed as she held a piece of paper and a pen in front of Kyo. "What&apos;s this for?" Kyo said curiously. "We&apos;re writing a letter to Tohru. Start the letter, tell her that she needs to come to the hospital because you remember everything about her. Tell her that you love her, don&apos;t forget to sign your name." "Why do you want me to lie about my memory?" Mary slammed her hand on the desk in Kyo&apos;s hospital room. The sweet voice she had oozed out of her mouth. Kyo started writing as fast as he could, her voice made something in his head want to obey her. Mary smiled and snatched the letter and ran out of the hospital. Mary ran to the Sohma&apos;s house, after taking a look at Kyo&apos;s files for the address. She place the letter at the door and knocked on it. Mary ran and made her way back to the hospital. Shigure opened the door, he was surprised to see just a single letter; to Tohru. "There&apos;s a letter for you Tohru!" Tohru took it and opened it anxiously. She read the letter multiple times, her cheeks burned red. Tohru ran inside and read the letter aloud to Yuki and Kenta. Kyo remembers? Kenta thought angrily. "Yuki, Kenta I want you guys to come with me." "Okay." They both said at the same time. "It&apos;s 8:50 right now and the hospital is about 10 minutes away. Want to head out now?" They walked the 10 minute walk making it to the hospital in time. Tohru signed in at the front desk and walked towards Kyo&apos;s room with Kenta and Yuki close behind. Mary nearly sat on Kyo&apos;s lap and they went over memories. Kyo was not comfortable, but was happy to see that there session would be over in 10 minutes. "What&apos;s so great about this Tohru Honda girl?" Kyo pulled his arm away, and scooted over to a different seat. I don&apos;t like where she&apos;s trying to lead this. Kyo thought nervously. "Can&apos;t I just...have a hug?" The curse! Although my bracelets gone, Mary is not an animal or part of the zodiac. I need to keep her away. Kyo grabbed her hands and held them by her sides. Kyo was annoyed with her constant flirting. Mary pulled her hand free from Kyo and touched her lips eagerly. "Just a kiss." Mary smirked as Kyo fell under her trance. Kyo connected his lips softly to Mary&apos;s. They kissed for seconds, Kyo hated it. Mary enjoyed knowing she had complete control of Kyo. She could get Kyo to do anything she wanted. Tohru shut the door quickly blocking Kenta and Yuki from view. He ran out of the hospital room. Tohru ran down the corridor, she felt a lump in her throat and tears were streaming down her face. Yuki looked at Kyo in disbelief with Kenta trying to run with crutches. "TOHRU. PLEASE THAT MENT NOTHING. SHE WAS JUST...fooling around." Tohru kicked Kyo he immediately dropped her. "Are you serious Kyo? We came to get you to escape. There are people after us. You don&apos;t even remember me do you?" Tohru sniffled. Kyo still didn&apos;t remember Tohru. "Bye Kyo, have fun with the nurse." Kenta grinned and walked out of the hospital following Tohru. Yuki spoke bitterly, before Kyo could answer Yuki walked out of the hospital. He put his fingers to his lips. "I know you liked it. 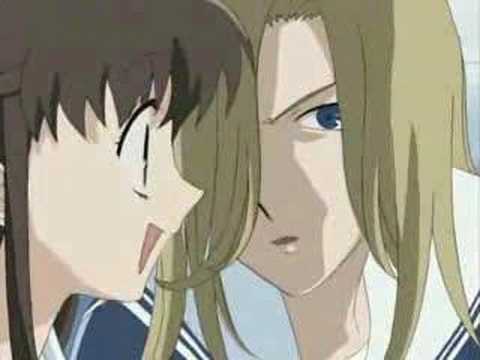 Did you see the look on Tohru&apos;s face, Hilarious!" Kyo quickly grabbed the jeans he had and changed into them. He grabbed his jacket and ran out if the hospital. I need to get out of here. Mary followed him and watched him run down the busy streets. You can&apos;t run Kyo. Mary thought evilly. Tohru ran down the streets with Yuki and Kenta. They finally stopped in an alley. Kenta breathed heavily, he threw one of his crutches trying to break it. Yuki leaned against the wall and slid down it slowly, his bottom hitting the hard ground. "T-Tohru...before you leave...I have to clear some things up with you." Tohru anxiously waited for Kenta to continue talking. "Your dad, he was never alive." Kenta hid his face in his hands. "We&apos;re also not technically brother and sister at all." Tohru frowned, she liked the idea of having a little brother. "Is that all?" She said sadly. Tohru took Kenta&apos;s hands from his face and looked him in the eyes. "I&apos;m not 14, I&apos;m 17." "You&apos;re so short though!" Tohru blurted by accident. Kenta smiled, "I&apos;m not this short," He snapped his fingers and grew more than a foot taller than Tohru, "See?" Tohru was shocked, he didn&apos;t see that Kenta was a lie this whole time. "I-Is your name even Kenta?" She said disappointed. Tohru wrapped her arms around Kenta as they left the Sohma residence for a while. "Bye Shigure, hopefully I&apos;ll see you soon!" Tohru waved. He smiled and waved. Tohru packed a change of clothes with some money she had from the last time she worked and food Shigure stuffed in her bag. Shigure was sad to see Yuki go along, but was fine with Kenta staying with him. "Bye guys." Tohru said quietly. Many drunks paraded out of bars and roamed the streets looking for fun. "I don&apos;t want any of these drunks to snag you." Yuki fastened his pace and they made it out of the bad area of town. Tohru and Yuki sat together at a fountain. Tohru took out a coin and made a wish. As she tossed it into the fountain she whispered, "Luck for wherever we are headed to next." Yuki&apos;s eyes glimmered in the fountains lights, "Where to now?" And does anyone else try to picture Kenta trying to run with crutches? BAHAHA! :D Don&apos;t forget to vote and comment! •What&apos;s the best holiday gift you got? P.S: Most of the scenes here were made to look good in a manga. Who would buy &apos;Kidnapped&apos; as a manga? I would...heehee.